Today, I received a mail from Starbucks and it's about Lady Gaga + Born This Way Foundation. 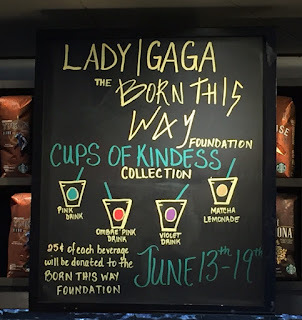 According to the mail and website, Lady Gaga and Starbucks share a mission to build a kinder, braver world. Starbucks will donate 25 cents to Lady Gaga's Born This Way Foundation for each purchase of Cups of Kindness Collection between June 13 and 19 and there're 4 beverages; Ombré Pink Drink, Violet Drink, Matcha Lemonade and Pink Drink. Among the 4 flavors above, Violet Drink and Matcha Lemonade are the new creation. The branch I went to had this board and I got a new Violet Drink. 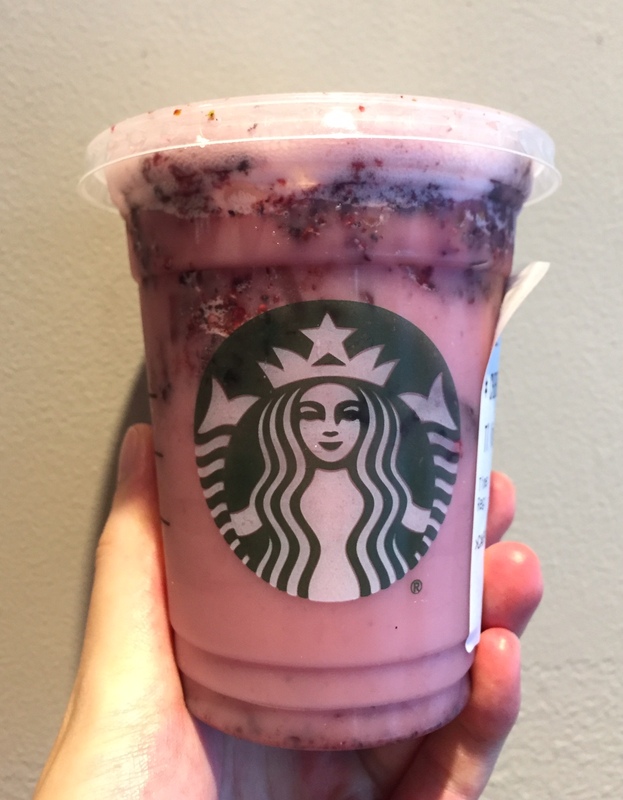 Violet Drink is "the sweet blackberries and tart hibiscus of our Very Berry Hibiscus Starbucks Refreshers Beverage swirl together with creamy coconutmilk and ice, creating refreshing (and violet-hued!) sips." The cashier could spell my name right without asking me how to spell it. When I brought it the outside, the drink looked pinkish purple. At the bottom, there're some blackberry pieces. There're some blackberries floating on the top, too, and I sipped after stirring it well. 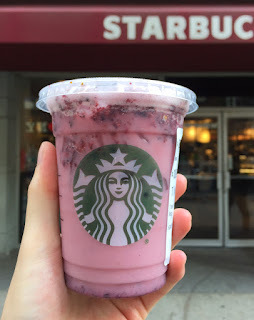 Very Berry Hibiscus Starbucks Refreshers Beverage uses real fruit juice and whole blackberries shaken with green coffee extract, but luckily I didn't taste any coffee flavor but just sweet and fruity blackberries and lightly sour hibiscus in the smooth coconut milk, the last of which didn't have much strong coconut milk flavor in a good way. Not all the rehydrated blackberries didn't come through the straw, but time to time I got the fruits in my mouth.